BRITISH MOTOR MUSEUM, Gaydon. Visitors are invited to join in with some ‘cracking’ fun activities this Easter at the British Motor Museum. Starting with a traditional Egg hunt over Easter weekend, followed by two weeks of ‘AutoScience,’ where the science that drives our cars is brought to life with live science shows, family tours, Technic workshops, and a Secret Mission family trail. The AutoScience Easter activities will run from 3 - 15 April. The AutoScience Live shows take place every day at 11am (Science of KAPOW! ), 2.15pm (Science of Speed) and 3pm (Science of KAPOW!). For LEGO® Technic fans, AutoScience Technic Workshops will take place daily from 10am to 3pm, a chance to get hands-on to design, build and test your own LEGO® Technic machine. Race it along the ‘Track’ with the fastest car of the day winning the title ‘Champion Designer’ as well as a prize. Open Weekend at London Transport Museum’s Depot, Acton 11:00 to 17:00 on 21 and 22 April 2018. For one weekend this April, London Transport Museum’s Depot in Acton, west London, will throw open its doors, giving visitors a rare opportunity to explore a treasure-trove of over 320,000 artefacts from London’s transport history. Celebrating London’s unique transport design heritage and its internationally recognised branding, Capital Design will showcase a fascinating and fun design-themed programme of talks, tours, interactive displays, and family activities. From guided tours of the Museum’s stunning poster collection and quirky object handling, to a talk from writer, broadcaster and cartography expert Mark Ovenden on 150 years of London Underground Design; transport enthusiasts, families, design fans, and people interested in London’s history can enjoy a bustling weekend discovering the great design elements that make the Capital’s transport network iconic. 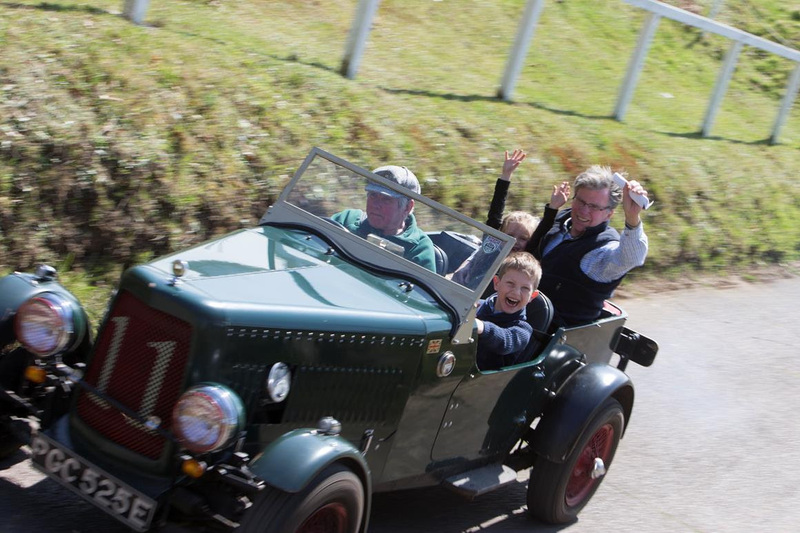 Easter Holiday Family Fun at Brooklands Museum There is some speggtacular Easter Family Fun at Brooklands this April with an Easter Egg Trail that will keep visitors entertained every day from 30th March – 15th April. The Museum’s long-established and hugely popular rides in vintage-style cars and on London Bus Museum’s iconic double-decker buses will also be operating during weekdays from 3rd – 13th April. The theme of London Bus Museum’s 45th Spring Gathering is “The Classic Bus Show” and the event will encompass a rich variety of buses and coaches as well as other vehicles on Sunday 15th April. Taking place at Brooklands Museum, the home of London Bus Museum, the site will be filled with bus displays and offer opportunities for visitors to ride on buses in the local area. RM2, the second of the Routemaster prototypes built in 1955 and brought into service in London Transport Country Area green livery on route 406. A Greater Manchester Transport and later ex-Stockport Corporation Leyland PD3 built in 1969.The oldest Bristol K double decker bus to carry its original Eastern Coach Works body and built in 1939.One of the last, traditional shape FX4 taxis which were built continuously from 1958 to 1997 and this fine example has travelled a quarter of a million miles. Parking for this event is free and located in The Heights off Wellington Way, please follow event signage on the day. There is also a free circular bus route 462 taking in Weybridge Railway Station. Lots of fun and exciting activities for all the family to enjoy together this Easter at Aerospace Bristol. Help Alfie Fox on his fact-finding trail, test your reaction skills with our hands-on riveting game & learn the principles of flight with hands-on activities under Concorde. Enjoy an inspirational short animation about Miss Todd – the first woman in the world to build and design an aeroplane, which will be screened in our John James Theatre, before you step aboard the last ever Concorde to fly. Keep the whole family entertained this Easter with a visit to Aerospace Bristol. Aerospace Bristol is proud to be part of RAF100 and join the RAF in commemorating, celebrating and inspiring future generations. 1st April 2018 marks the centenary of the formation of the RAF. It was on this date in 1918 that the Royal Flying Corps and the Royal Naval Air Service merged to form the RAF; the world’s first independent air force. The RAF has a very strong association with Filton dating back to the First World War. The airfield was used by The Royal Flying Corps from 1915 and an Aircraft Acceptance Park was built in 1917. Aerospace Bristol Hayes Way Patchway Bristol BS34 5BZ Please note that the above post code does not take you to the exact entrance of the museum. You can find our precise location on Google Maps.